STORYBOARDS 101: WHAT THEY ARE AND HOW TO USE THEM EFFECTIVELY. When we first hear from a client about producing a video for them, we will get asked, more frequently than not, to create a storyboard for the project. I have mixed feelings about storyboards, so we will usually try and persuade the client away from using them - at least at that point in the project. I think storyboards can be a great addition to a project, but they aren’t for everyone and (more importantly) they certainly aren’t for every project. For those of you who might not be familiar, storyboards are typically a frame with some imagery inside and then some additional visual or audio related notes for the viewer to see. They come in a variety of formats, from single cells per sheet, to 2x2 and 3x3 grids, and everything in between. Normally the upper cell is formatted in a 16x9 aspect ratio (the ratio most films, videos, and television shows are in) with some room underneath to make notes in. Notice the detail listed in the notes. The upper cell is the visual area where you're showing what the shot will look like and the note area below is where you can add in additional info that's helpful for the project. Depending on the project you might include audio notes (such as music or SFX), camera components (such as lens or aperture), camera movement (such as a pan, jib, or dolly shot), or other things like mood (such as contemplative or tense), lighting notes (such as strong backlight or hidden in shadows), or even edits you want to see (such as cuts or fades). When it comes to what you should include in this information section it’s typically very project specific. Sometimes I'll make storyboards just for myself so I'll include camera movements, lenses or focal lengths I want to use, or additional lighting or gear notes. If I'm making a storyboard for a client though they don't really need all that information so I'll just put a general overview of what I want a viewer to see and hear in that particular shot. A basic but pretty standard storyboard frame. Storyboards are a great way to visually represent a project before any filming has been done. The producers, clients, and director-of-photography / cinematographer / videographer can all get on the same page as to the creative look and visual feel of the video. They can be used to help plan individual shots or entire shoot schedules, they can help a client show the producer or director what they have in mind, or conversely they can show the client what the producer and director have in mind. Overall, storyboards can be immensely helpful, so why don’t we use them all the time? First off, whether or not you need storyboards depends heavily on your project. For instance if you’re filming an event for a future promo or recap video you likely don’t know what will be happening, so storyboarding can be both difficult for the videographer and provide unrealistic expectations for the client, both of which can complicate the project later on. You might not have the room to get that epic dolly shot of the band playing or you might not have the time to swap lenses to get that great zoomed in shot of the parade stretching down Main Street. Because a lot of event videos rely on capturing the spontaneity of the event itself, it’s tough to try and pin down exact shots, so I don't recommend using storyboards in circumstances like these. Storyboard frame from a golf commercial we produced. Let’s say though that you’re tasked with creating a video to promote a local business or organization. Creating a storyboard can be incredibly helpful in situations like these. As a producer they can give you a way to show the client some ideas, and more importantly give them a realistic idea for what you can achieve. They can also provide you with a way to show your crew, your production assistant, or even just your dog, your vision for the project so everyone knows what’s going on. Additionally, planning your shots out via a storyboard is a great way to really examine the project critically and determine what gear you’ll need, what your timelines for each shot might be, how big of a crew you’ll need, and also provide some parameters so you aren’t just filming off-the-cuff. Storyboards can be very beneficial for projects or scenarios like this. 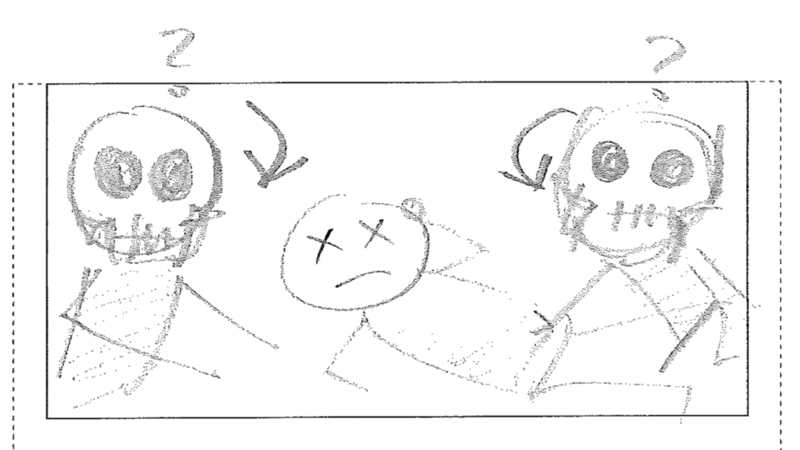 “But what if I can’t draw?” This is usually the first question I get when discussing storyboards with people. I’m guessing the thought is that unless you can draw or sketch something as lifelike as a real frame from a film then maybe you shouldn’t do it. However, storyboards aren’t meant to be a replacement for the video or film you’re working on, rather, they’re meant to be a guideline for the project. Storyboards are simply a means to an end, and it’s more important that they help you in the creative process, rather than hinder you in the production process. So, even if you can only draw stick figures you can still make and use storyboards very effectively. In all honesty I don’t see the need to draw anything more than basic stick figures and shapes when creating storyboards - if done properly those can clearly and effectively illustrate your ideas. And technology is here to help too - with a variety of apps, digital options, and storyboarding programs you have plenty of routes to take that don’t involve you drawing a single stick-figure. As I said earlier storyboards can be a very helpful part of the production process, but unfortunately they can also hinder it. Filmmaking is about telling the story the best way you can with the tools and resources at hand, and a lot of times that means adapting to factors or variables outside of your control. I regularly cross off storyboard shots I initially wanted or sketched out simply because the project no longer warrants it, or we just can't make a shot work. And in most cases my storyboards are just used as guidelines for what kind of shots I want - here's a brief sample of a shot that I wanted to get for a golf commercial we produced, but the framing just didn't work the way we wanted when we were filming so we adapted, backed the camera off a little, and still came away with a great shot. As a content producer, it might be up to you to step back and make some changes to get the production back on track and get everyone back on the same page. I think storyboards can be a great tool for a lot of projects, but like all tools they need to be handled with care and with the proper knowledge of how to use them, and if they aren’t working they probably aren’t the right tool for the job. Here are a couple examples from a project we did a few years ago for our local Humane Society. These shots turned out pretty true to what we had envisioned early on. There are a lot of storyboard templates out there if you're looking for some to use - I personally like the ones from PrintablePaper.net - or you could even try making your own! And as a fun way to end this post, here are some storyboards from a couple different projects of ours, submitted entirely without context. If you want more gear reviews, tips, tricks, tutorials, fun behind-the-scenes posts, and random storyboard frames, then sign up for our newsletter, subscribe to Droi Media on YouTube, like us on Facebook, and follow us on Twitter and Instagram!